Daniel Lanois is an award winning producer for bands including Brandon Flowers, Neil Young, Bob Dylan, U2, and more. Coming in April 2012. Paper Route are releasing their sophomore major label album The Peace of Wild Things this year on Universal Motown. Paper Route have toured with Paramore in 2008 and 2009 and Owl City and LIGHTS in 2010. The Moth & The Flame are a fast rising group from Provo, Utah. They include Parlor Hawk keyboardist Mark Garbett, former Imagine Dragons drummer Andrew Tolman, producer Nate Pyfer, and singer Brandon Robbins. The group have performed with Imagine Dragons (Interscope), Fictionist (Atlantic), LOW (Sub Pop), Cobra Starship (Fueled By Ramen/Decaydance), All Time Low (Interscope), Martin of Boys Like Girls (Columbia), Iyaz (Reprise), Downtown Fiction (Photo Finish), Shontelle (Universal), Joshua James (Northplatte), and many more. Their debut album How We Woke Up is making a solid splash for it’s impeccable production. The album’s artwork is by award winning graphic artist Andrew Capener. And, the album is only available as a hardcopy to preserve the artistic value of the record (not available on iTunes, Amazon, etc). Coming April 2012 to BYUTV Imagine Dragons will be the pilot episode for indie-rock show AUDIO-FILES. Other revealed acts also being featured include LOW (Sub Pop), Paper Route (Universal Motown), and Joshua James (Northplatte). 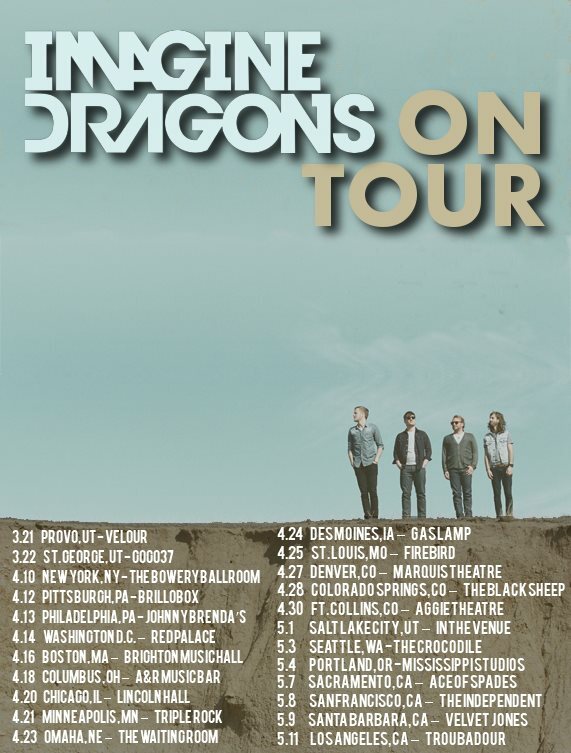 Imagine Dragons are now on tour with Australian group The Jezabels (#2 AUS). They just finished a stint of 10 performances at SXSW Festival 2012. These included the mtvU Woodie Awards Festival, FILTER magazine party, Rachael Ray party, Universal Music’s FRYE DAYS party, The Roxy’s Official Showcase, and several others for MTV, etc.